The last will and testament of Daniel Schlapia being in good bodily health and of sound mind and memory, calling to mind the frailty and uncertainty of human life and being desirous of setting my worldly affairs and direction how the estates with which it has pleased God to bless me, shall be disposed of after my decease and hereby revoking and making null & void all other last wills. My will is that all my just debts & funeral charges shall by my executors herein after named be paid out of my estate as soon after my decease as shall by them be found convenient. 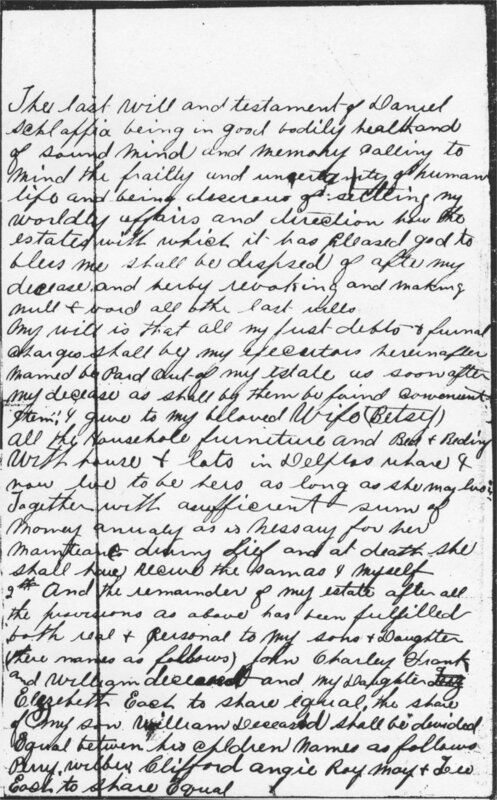 Item: I give to my beloved wife (Betsy) all the household furniture and Bed & Bedding, with house & lots in Delphos where I now live to be hers as long as she may live. Together with sufficient sum of money annually as is necessary for her maintenance during life and at death she shall have receive the same as I myself. 2 And the remainder of my estate after all the provisions as above has been fulfilled both real and personal to my sons & daughter (their names as follows) John, Charley, Frank, and William deceased and my Daughter Elizabeth Each to share equal. The share of my son William Deceased shall be divided equal between his children names as follows. Perry, Wilbur, Clifford, Angie, Roy, May & Lee each to share equal. 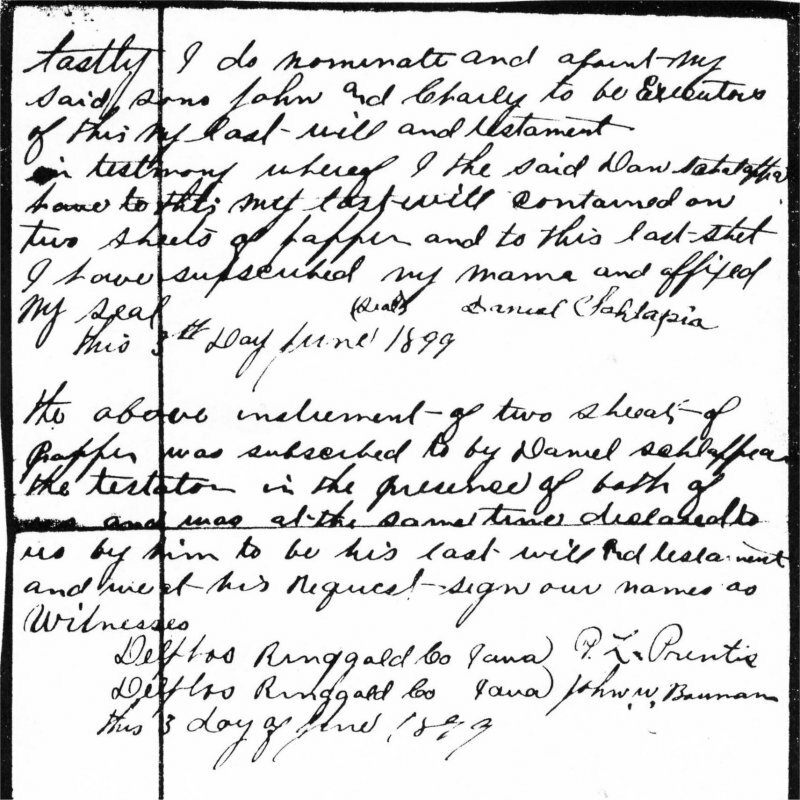 Lastly, I do nominate and appoint my said sons John and Charley to be Executors of this, my last will and testament, in testimony whereof I the said Dan Schlapia have to this my last will and contained on two sheets of paper and to this last sheet, I have subscribed my name and affixed my seal. The above instrument of two sheets of paper was subscribed to by Daniel Schlapia, the testator in the presence of both of us and was at the same time declared to us by him to be his last will and testament and we at his request sign our names as Witnesses.